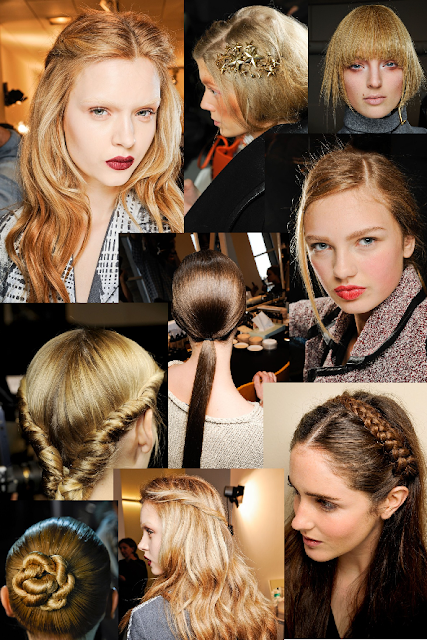 So I have been doing loads of research this week on A/W 12 hair and beauty trends for my internship so I thought I would share some of the more workable trends with you! So side partings are big news this season, especially when paired with loose wavy curls. Think off duty model look. The biggest look, which was EVERYWHERE, involved taking two front sections of your hair twisting them around and pinning them at the back of your head with the rest of your hair flowing free. Think loose carefree easy breezy waves. This seasons buns are neat and tidy think prima ballerina not messy top knot. The ponytail is back, as it is every season, but like the bun the look is chic and sleek this is not a gym bunny style. Accessories are huge this season so make sure to adorn your hair with something snazzy! Fringes are super straight so get your straighteners out. And my favourite trend? Braids, plaits and twists. Hair looks so intricate but it is actually really easy to achieve. Simply plait your hair and arrange in different styles! Very Princess Leia!